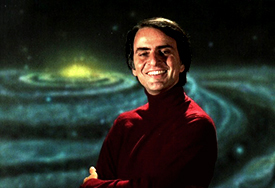 Dr. Carl Edward Sagan was a teacher (a highly respected professor of Astronomy and Space Sciences) who loved sharing knowledge, particularly that which expressed his enormous fondness for science, most notably in the areas of astronomy and the inner workings of the universe. He was well-suited to his role as Director of the Laboratory for Planetary Studies at Cornell University, and was also an integral advisor to NASA where his many duties included briefing Apollo astronauts prior to their trips to The Moon. Presenting complex topics in a manner that makes them easy for everyone to understand, regardless of their level of education, was one of Dr. Sagan's most important talents, and his teachings inspired deep and far reaching interests in the sciences for people throughout the world. 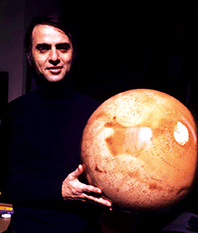 By educating the world in the fundamentals of science, Dr. Sagan built an important, rational, visionary foundation that had an enormous impact on the world, and promises to encourage progress amidst a wide range of scientific discovery for many generations to come.